Before you break the rules, learn them! If you don’t bother learning the basic techniques, you don’t have the skills available to you that those techniques provide. For example, if you attempt to draw a face, but you never learn about perspective, shading, lighting, or proportions, the drawings you produce will never be truly life-like. You could always say, “Well, it’s art … I just meant to have it look flat and distorted.” But what if you didn’t? What if you really want someone to recognize themselves in what you draw, but no matter how hard you try, you can’t capture their likeness? That is when learning the techniques first would come in handy. 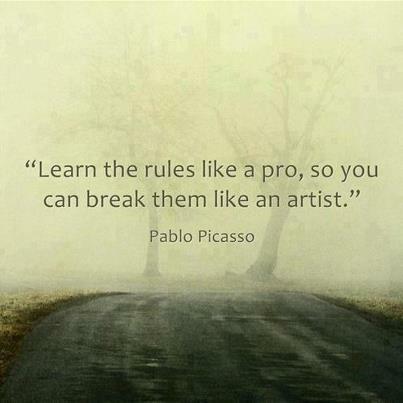 People point at Picasso to show someone who breaks the rules. Most people have only seen his cubist works … the paintings of figures that look like they are people made out of building blocks. What they don’t realize is that Picasso was painting near photo-realistic portraits of nobility in his teens and twenties. Picasso knew how to accurately reproduce what he was looking at FIRST, before he got bored with it and created Cubism. I am seeing that evolution occurring in my own fitness journey. I am getting to the point where exercise is more of a habit, and less of something I have to remind myself to do every day. I am learning to listen to what my body is telling me, and figure out how to adapt to keep working out, while still giving my body the space it needs to heal and grow. I am learning how to trust these basic skills so that as I continue, I can build and create a truly fit life for myself. Where have you mastered the basics in your life so well that you know you can break the rules? Where are you committed to learning the basics first? Share with us your journey on the road to mastery. This entry was posted in Home Gym, Motivation & Goal Setting and tagged adapting workouts, exercise, fun, healthy-living, learning, mental-health, motivation, patience, persistence. Bookmark the permalink. Reblogged this on FabPoet's Blog.